The meat-plus-fire basics of grilling haven’t changed much since our caveman days. What has changed, however, is the variety of handy tech tools that take backyard and tailgate grilling to the next level. From Bluetooth meat thermometers to remote control smokers to clip-on grill lights, these tech tools will turn any cookout novice into a pro. Here are Techlicious’s favorite grilling tech tools for the perfect summer cookout. It’s not quite football season yet, but there’s no reason why you can’t start the tailgating party a little bit early. The Coleman Road Trip Grill LXE is one of Techlicious’s favorite outdoor grills. It’s has its own fold-up stand with wheels built in for easy storage and travel, electronic ignition so you don’t need to mess with matches, and a pair of side tables to hold your food before and after cooking. 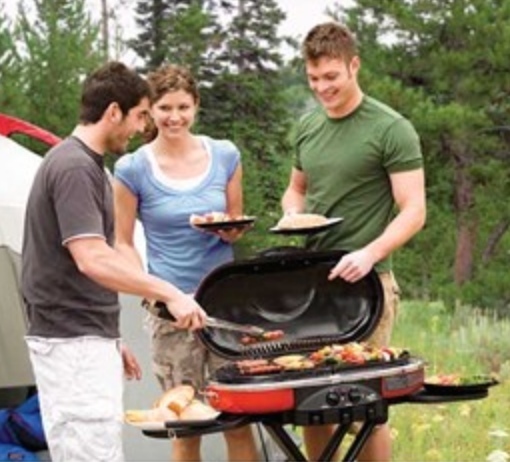 The grill even comes equipped with a griddle – perfect for early morning camping trip hotcakes. 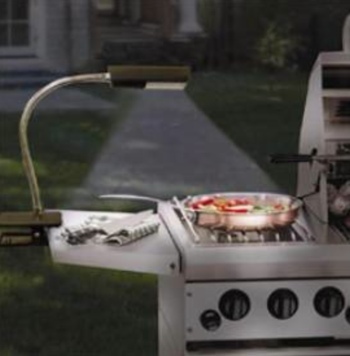 Grilling doesn’t need to stop when the sun goes down with the cordless Maverick Gooseneck-style LED Grill Light. A simple-but-sturdy clip mounts to your grill’s ledge, while a flexible 12-inch gooseneck bends anywhere you need extra light. And since it uses energy-efficient LEDs, you can get a full summer’s worth of cooking done on just 3 AAA batteries (included). Nothing ruins a good grilling party quite like a bout of food poisoning. Make sure all your poultry and pork is properly cooked with the iDevice iGrill 2. The thermometer supports up to four probes, so you can keep an eye on everyone’s food. 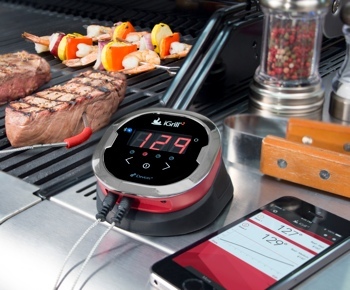 And with Bluetooth connectivity built in, you monitor your steaks right from your iPhone without losing heat from your grill or smoker. For a less expensive option, consider the smaller $39 Bluetooth iGrill mini. There are a lot of ways to cook chicken, but my hands down favorite method for the juiciest, most flavorful bird is rotisserie. 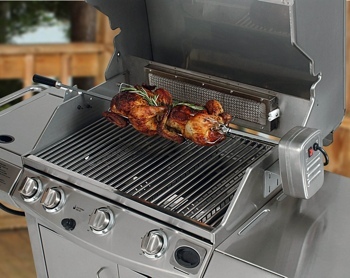 Char-Broil’s Premium Kit with 6-Burner Electric Rotisserie comes with two 4-prong meat forks, turning most gas grills into roasting machines perfect for chicken and larger roasts alike. Installation is easy with the included brackets, though some owners report that they had to manually shorten the spit rod to fit smaller grills. A massive squirt of lighter fluid may get your grill ignited quickly, but it can give your meat a nasty chemical aftertaste. 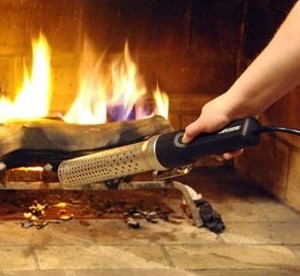 For a cleaner, greener, gas-free ignition, check out the electric-powered Looftlighter. Rather than throwing flames, the Looftlighter blasts charcoal with a stream of air that reaches 1,256 degrees Fahrenheit. It can take up to 60 seconds to actually ignite wood and charcoal, though, so you’ll need a little bit of patience with it. You may also need an extension cord if you’re grilling outside. Want to give your barbeque cookout some real smokehouse authenticity? 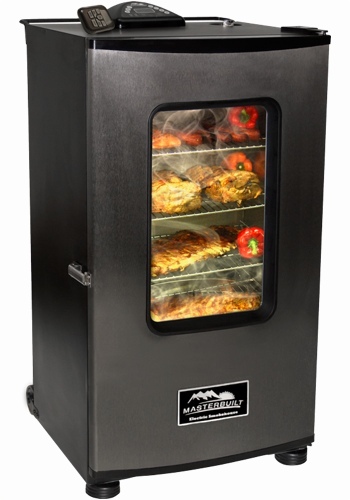 Take a look at the 30-inch Masterbuilt Electric Smoker. This full-fledged outdoor kitchen appliance comes with four racks and a lighted viewing window, letting you easily monitor your food’s progress even at night. If you’re entertaining guests, you can operate the smoker from up to 100 feet away with the included remote. And don’t worry about overcooking – this smoker has a built-in meat probe to keep constant tabs on your food’s temperature. A larger 40-inch version is also available.